Fangs can be installed by visiting the Mozilla Firefox add-ons website at https://addons.mozilla.org/ . To render a web page with Fangs, open the web page in Firefox and choose Tools, Fangs. 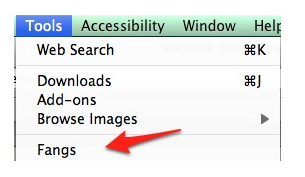 When the Fangs window opens, select the Screen reader output tab to see how your web page would be read back by a screen reader. The Headings list tab will display a list of the headings Fang was able to find on your web page. The number to the right of each heading text will be the level of the heading (1 for heading level 1, 2 for heading level 2, and so on). This tab simulates the keyboard shortcut available on many screen readers that allows the user to hear a list of the headings on the page. Many screen reader users rely on headings for navigation. Similarly, the Links list tab will display a list of all the links on the page. As with headings, most screen readers support a keyboard shortcut that will let the user hear a list of the links of the page.